Are You Ready For A Season Of Bluebirds? You can be, with the best Eco Friendly Bluebird House for the Eastern species from Duncraft. The house you'll never have to replace. Did you know the Eastern Bluebird averages 2 broods each season, sometimes as many as three? This means just one of these bluebird houses can give you nearly a full summers worth of bluebird activity! Did you know that these blue beauties will return each new season? Year after year you'll be attracting these birds to your backyard. Bluebirds need your help. Each season when the Bluebirds return, they have to fight the more aggressive House Sparrows for nesting sites. Often the less aggressive Bluebirds lose out. Sometimes even killed by the non-native House Sparrow. Now you can help by giving your Bluebirds a place to raise their young. 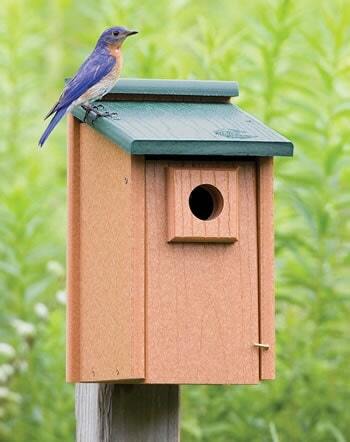 Wild Bird-Watching is proud to recommend Duncrafts Eco Friendly Eastern Bluebird House, made to last a lifetime. Which we think is best. Hygienic, made with recycled plastic and has the requirements bluebirds need for proper ventilation, floor size, entry hole. Predator guard around opening makes it difficult for raccoons and other predators to reach inside and harm any young birds. The Eco Friendly Bluebird House has a wood-grained finish, sturdy all-screw construction and is completely impervious to weather. Front opens for both nest checks and cleaning between clutches. Place these bird houses on a post or pole 5 to 6 feet above ground in an open grassy area, and begin attracting Bluebirds to your home today!